It’s not often that I have two titles — in fact sometimes I can’t even think of one title. I can’t decide which one to use so as I add content I am just going to leave both of them up there. Shopping for Stone or Real Life Gym — well when you go shopping for stone you are using real life gym skills over and over again. There are also more levels on stone shopping than most people would realize. But that’s the real content of the post and I should actually start with a recap on why it’s been so darn long since I posted. We definitely didn’t have a great spring weather wise and so we seemed quite behind once we got outside and got working on things. I’m pleased to report that the raspberries, the garden hedge and the lilacs are all doing well. We do have a few evergreen trees that are dead and a few that haven’t decided if they are going to make it or not. We continue to water trees and bushes as necessary — usually it rains the day following this activity! We have eaten loads of produce from the garden with more to come so even though the spring was wet and cool the summer has been hot with enough moisture for the garden to grow. I love having a farm size garden again but really it’s a challenge to keep it all up with only a hoe. I am pretty sure I only have one item on my birthday Christmas list and that is a Stihl small rototiller. Again though the real life gym benefits of endless hoeing and digging and pulling weeds is a stronger back, good arm muscles and dirty fingernails (well ok that isn’t a benefit is it!). While the spring and early summer days weren’t great it was good for us as I spent some time upstairs sewing decorations and gifts while Ron spent some time in the garage creating several items for Alyssa and Taylor’s wedding. We started early and yet it was still a bit of a last minute rush to create it all and have it end up like her vision! And what a lovely vision and a fabulous day it was for Alyssa, Taylor and all of us. We were blessed with fabulous weather (which is kind of a must for an outdoor wedding) and we had enough helping hands to pull it all together. Alyssa looked so incredible in her wedding gown and Taylor looked very handsome. I could really do a whole blog just about their wedding but I must remember that it is an “old house blog” and so do try to keep that focus. So now that the fun is over we are getting down to work on the rock wall and finally seem to be making some progress. We have now spent several days working at it and seem to have a fairly good flow of tasks. It is awesome that we now have a mixer for the mortar – it’s still hard work but not near as much as mixing by hand. The first gym work out there is adding the 9 heaping shovels full of sand followed by 3 heaping ones of masonary cement. The water is the easy part and as long as the mixer works and doesn’t jam that part isn’t hard. Then it’s time to dump the mortar into the wheel barrel. Work on number two comes from holding the heavy mesh lid open while the inside is hand cleaned out – even when your arm muscle is burning you don’t let go as you don’t want it to hit someone. The messy part comes when you take the hose and clean it out and then dump the sludge. Every day I end up wet and messy from this task. So then it is time for rock shopping. I know when you look at a picture of the rock wall it appears to be random and yet it isn’t really. 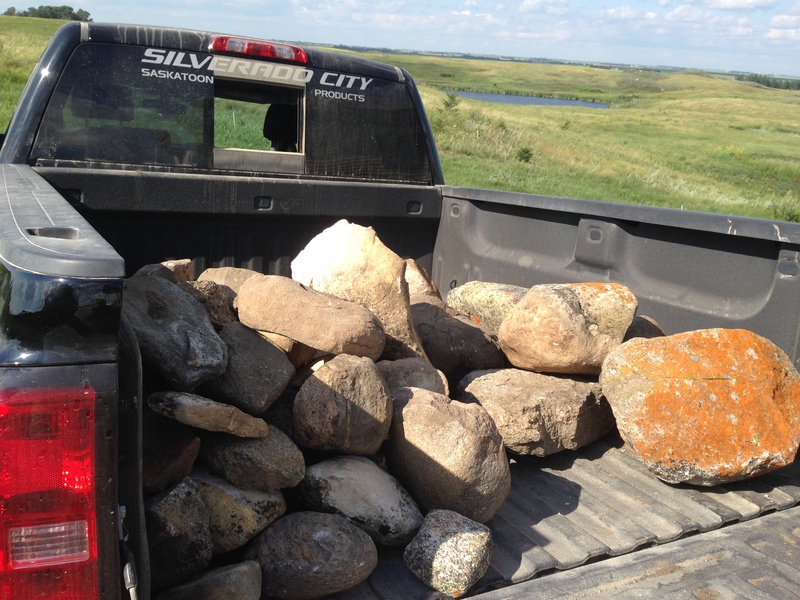 We pick rocks from one of the many piles near our house – again with the gym analogy. Pick up and carry to truck. Unload and sort. Hm – doesn’t sound like much but some rocks get handled a lot of times. 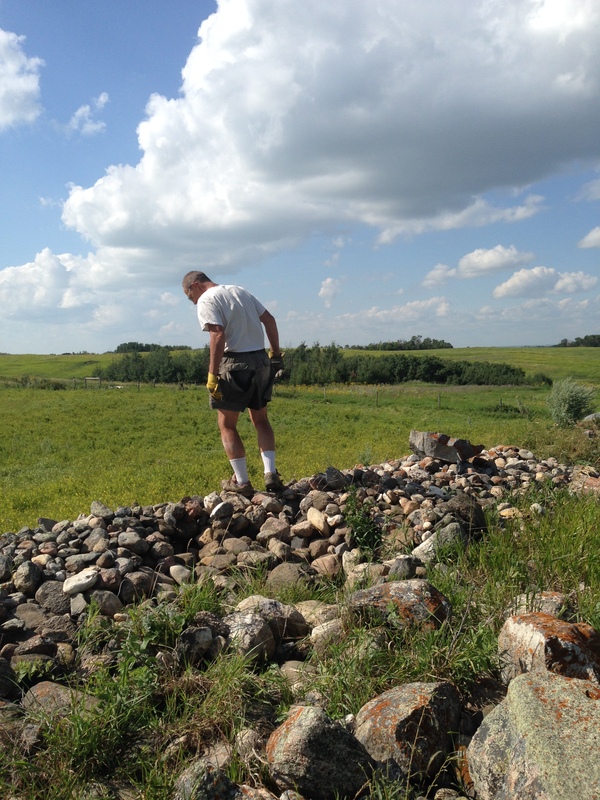 We try to keep the pile sorted so that requires some extra handling – flat rocks for the top on one side/large to a large small uglies next (basic ugly shape rocks that build the inside of the wall)/ smalls next and then the large to medium front rocks. 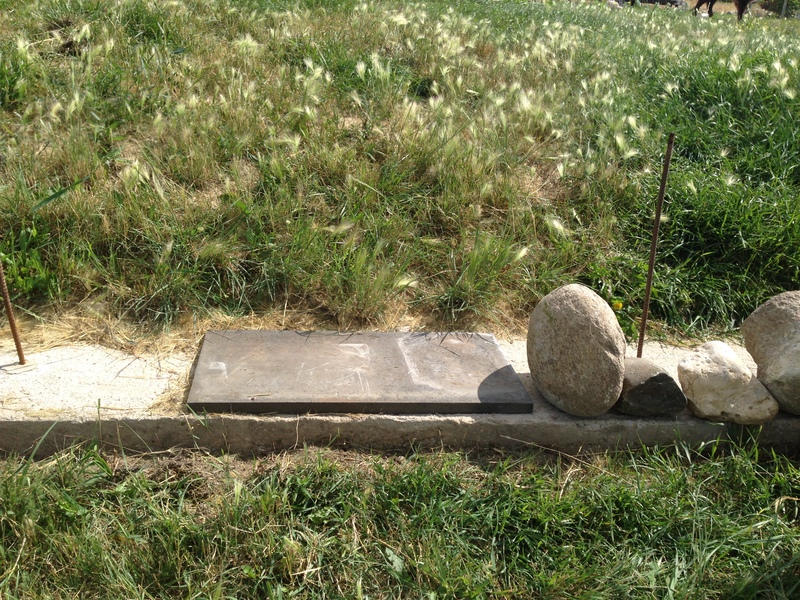 We try to keep the rocks in order but sometimes it doesn’t always work out that way. Plus we end up with loads of holes from picking certain sized rocks out so we try to keep the top area full and add new rocks at the bottom of the pile. As you can see this is the weight lifting part of the program. Ron has some serious “pipes” and mine aren’t bad for a 55 year old either plus I try to remember to tighten my core and use it to help lift. So now that we have rock shopped and sorted we rock shop in a different way. We trial rocks for the front as the starting point and then we have to create the back wall followed by the inside. Then we repeat this times four layers with mesh between two of the layers. So we shop for a lot of rocks and there are some beauties and some uglies. The front of the wall has to be finished off smoothly but the back of the wall (which gets covered in) is left pretty basic. 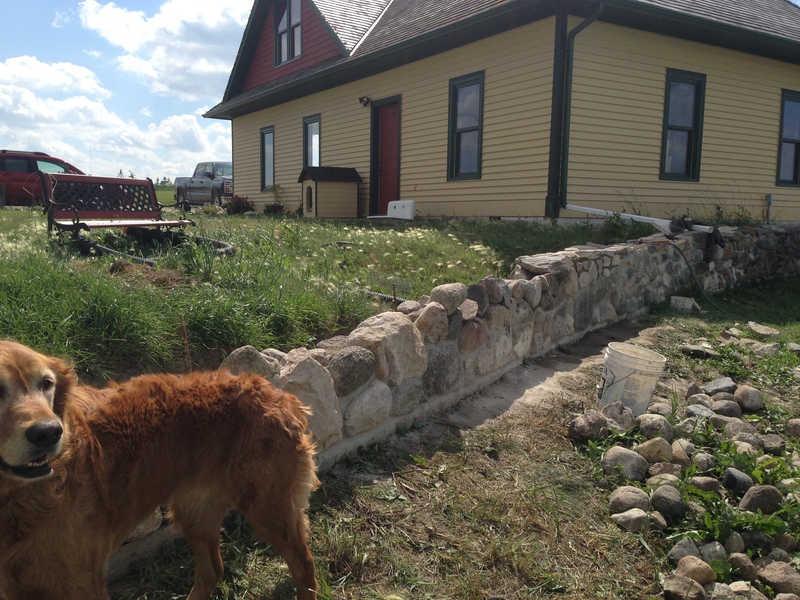 That’s the area that Spencer and I get to work – Ron does the front wall. Like most tasks the finishing work takes more time than the big work. It all seems a bit slow though as we have about 50 feet of it to do and at this point we have finished about 12 feet. We have now laid out the front of the entire wall, dug out the back (as the weeping tile from the garage gets placed into it) and planned the steps down to the walking path. So in the last three days we really feel like we have made some serious progress and we have three more summer weekends to work on it so just maybe!! Real life gym work out right here! A selection of flat rocks — all sizes. As well this is a nice close up of a section of finished wall. Ron out rock shopping. In his very classy shorts!! Trial run of front rocks and the step. This picture gives the scope of the project. We started back by the down spout — you can see the colour change in the mortar. I’m not sure why Lucky seems to be featured in all the photos but they do like to hang around and sleep in the shade of the wall. This afternoon I took a break and went with them to the pond for a swim — I’m not sure why they don’t wander down without me but they don’t! Me and my shadows. We spent last weekend at Diefenbaker Lake attending a Bradford family reunion. It was a fabulous time – lots of laughter, stories and a few cold brew plus some good food. It turns out that I have several cousins who read my blog – who knew??? Remember – we do love to do tours so anytime you are in our neck of the woods come on out for a visit. OK — IF (and it’s a big if) I can get the pictures to upload I am finished tonight’s blog post. I have decided that the real name should be real life gym — it’s all about the constant work out but we do shop for the right stone. I know it’s not what most women go shopping for but it works for me (cousins Lynette, Colleen and Yvonne — just go buy me some clothes hey!). I love the long days outside in the sunshine working with my man and the nice cold beer at the end of the day. Closing with the usual artistic type photo — but had to chose two. I went looking for flax fields (last year’s photo taken on a rainy day wasn’t what I was after) and found blue skies and canola. Ah — someday when I retire I’m going to love biking around and taking pictures of this, that and the other thing. Till then I had better get to bed so I can get to work!! 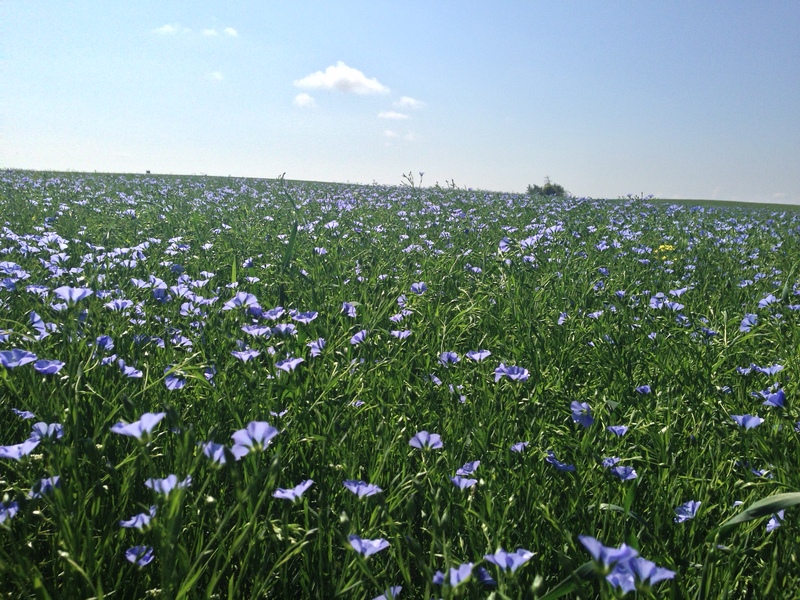 I found the flax field — ended up with an up close view as the distance one just didn’t go it justice (I couldn’t get to the east side of the field which is where I needed to be). Even so it’s a pretty good artistic attempt. 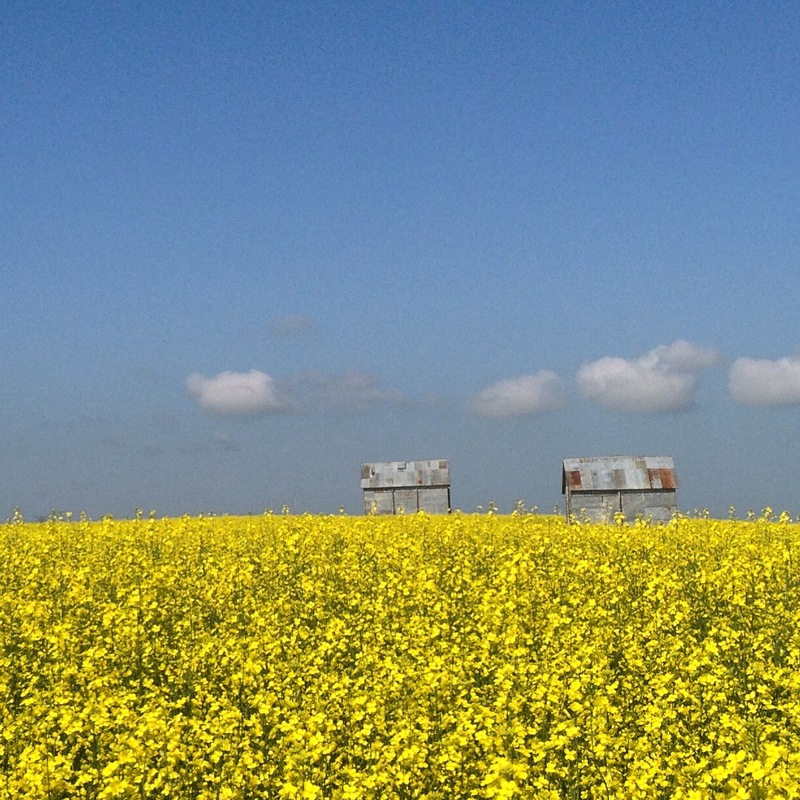 I went looking for flax fields but was taken by these two old buildings surrounded by blue skies and canola. PS — cousins and others. Up by the title is the “leave a comment” button. You just type in what you want to say and hit post. I will then see it and put it into the blog post. It’s pretty easy — my mother the smic (senior matriarch in charge) has figured out how to do it. ahh, wondered why I hadn’t heard from you in a couple of weeks!!! You have been busy!! Great wall! (the “Great Wall”??) It’s going to look wonderful. So glad Alyssa and Taylor’s wedding went off without a hitch. Beautiful couple. And remember me when you are out biking. I like riding around the countryside too. We got a very nice delivery today of 4 stone pieces — flat big pieces!! Pays to have nice neighbors!! If we rode together someone has to ride the hill outside your house twice! The wall looks amazing! As the daughter of a mason, I can relate to your description of the cement mixing and the cleaning ritual at the end of the day! Takes me back to building the cabin with my dad! The rock shopping reminds me of our recent hike in Lake O’hara. One of the day hikes was to an alpine lake called Lake McArthur and there were a lot of rock slides. We spent over an hour looking at all of the different types, even taking pictures of the really cool ones. Would love to come out one day! On holidays for a little while but will contact you when we get back! P.S. You posted an amazing picture the other day of a beautiful sky and some wheat on Facebook. I wonder if I can get a copy of it, I loved it. I thought perhaps I was talking to the deaf and no one wanted to hear about stones and mortar. I’m so glad you can relate! Come visit and then we can figure out what picture you are talking about — I have thousands as Ron will attest to! I do look at your blogs. I just don’t know how you find the time and have the energy to do so much with your house! Do the hours last longer in Canada? Alyssa wedding photos are lovely. The days have the same length of time in Canada Pamela — I just don’t sleep much it seems and rarely sit still. But I love what we do! Great start on wall. Thought you were doing the retaining wall at the back. 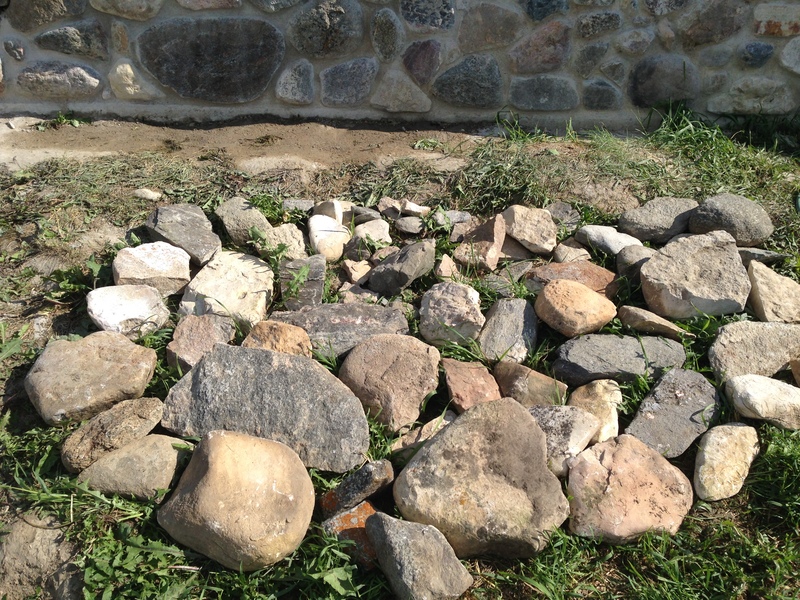 I built a rock flower bed once and remember the hours of looking for the right rock to fit a spot. Keep up the good work. Yes it dos take quite some time to find that elusive rock; esp if you are a perfectionist like someone I know! We have to finish this one and then move to the retaining walls on the walk out — Ron regularly has to remind me that Rome wasn’t built in a day! HAHA — you ain’t seen nothing yet!! Wait till you see our next two projects!!! trial run here to see if indeed one can leave a post on a blog post that doesn’t show up on the inside of word press.still can’t figure out the missing photos either.